Change your life in one day with the Prettau® Implant Bridge! Missing teeth can cause many problems. For one, there are the obvious aesthetic issues related to tooth loss, making people feel self-conscious to speak, smile, and laugh, even around people that they’ve known for years. In addition, there are the various health and wellness problems associated with missing teeth, including problems chewing, loss of bone density in the jaw, and gum recession. That’s why many people are replacing missing teeth with the Prettau® Implant Bridge. While initially it seems less expensive to get a traditional denture, implant supported bridges pay off tremendously in the long run. The dental implants provide anchored chewing support and prevent bone and gum loss, which results in a longer lasting smile, preserved oral health, and less long-term payments for replacement and restoration procedures. Implant supported dental bridges preserve your bones and gums so that you can continue smiling and chewing for years to come. Many of our patients come to see us after pouring time, money, and energy into treatments with questionable long term prognosis. If you suffer from broken crowns, defective bridges, failing root canals, questionable periodontal health, loose or ill fitting dentures, the Prettau Implant Bridge may be ideal for you. Those who have had success with this treatment have gone from hiding toothless smiles, struggling through painful meals, and avoiding conversations to feeling whole again, regaining confidence in their appearance and their expressions. The Prettau bridge is the longest lasting, most effective way to replace your missing teeth, bar none, and we are proud to offer it to our patients. The Prettau Is Made of Zirconia. No Cracking, Breakage, Chipping or Staining! If you are looking for the most esthetic and durable, permanently attached implant supported teeth replacement option, the Prettau Implant Bridge is the clear choice! The Prettau Bridge is made of Zirconia, the strongest tooth colored material used in modern implant dentistry. If you’ve been told that an acrylic hybrid bridge (a titanium metal bar covered with pink acrylic and plastic denture teeth) or a metal bar overdenture with plastic teeth are your only options, you should think again. The Prettau Bridge has so many advantages over every other tooth replacement option available today. Prettau is made of Zirconia which is totally biocompatible with the human body. It’s the strongest dental material available and is tooth colored, so the cosmetic results look totally natural and will last many years. Dr. Herman will custom design your Prettau Implant Bridge to give you a long lasting beautiful smile that will make you look and feel younger and healthier. There’s no metal to hide and no acrylic or plastic that can stain, crack, chip or break. The clear choice is to replace your teeth with the Prettau Zirconia Bridge, not with acrylic. Our practice is one of only a very few dental facilities to incorporate this technology in the USA. Our teams experience in dental implant procedures and cosmetic full mouth reconstruction, supported by our advanced technologies is why we are offering our patients the most naturally esthetic and predictable advancement in dental implant restoration — The Prettau Zirconia Implant Bridge. We feel that this is the future of replacing teeth that are missing or will be missing. No acrylic or porcelain to chip, break or wear, totally impervious to staining and odor absorption, no metal substructure, gorgeous long lasting esthetics, and digitally milled and designed. Stop the endless cycle of replacing failing dental work, root canals, large silver fillings, recurring gum disease, loose teeth and dental infections. The Prettau Zirconia Bridge is a permanent teeth replacement option to replace failing or missing teeth, failing dental work, or full or partial dentures. This is the future of dentistry and it’s available now at Herman Family Dentistry. 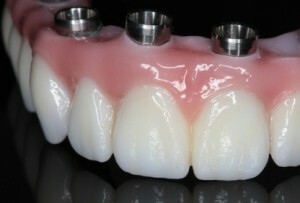 The best candidates for Prettau Zirconia Implant Bridges are people who are missing multiple teeth. These patients should have sufficient jawbone and gum tissue structure in place to support a dental bridge. The team here at Herman Family Dentistry will provide you with detailed information about the Prettau Implant Bridge during the consultation process. 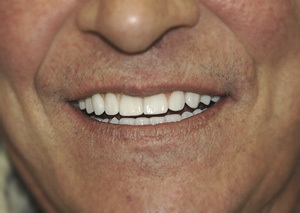 The average cost of the Prettau Implant Bridge will vary from patient to patient depending on his or her needs. For this reason, placing an estimated price on the website is not indicative of the full story or circumstances of treatment. Alternatively, dental bridges provide a longer-term and healthier solution for tooth replacement. Instead of having to reshape the adjacent healthy teeth, one or more dental implants are positioned into the gums to function like tooth roots. These dental implants attach to the dental bridge, creating chewing support and preventing bone or gum loss. In addition, implant supported dental bridges are slip resistant, since they are attached firmly to the implants. If you are considering dental implants or implant supported bridges, contact us for a free evaluation. Dr. Herman and his knowledgeable staff will help you learn more about the Prettau Implant Bridge and how it can change your life!